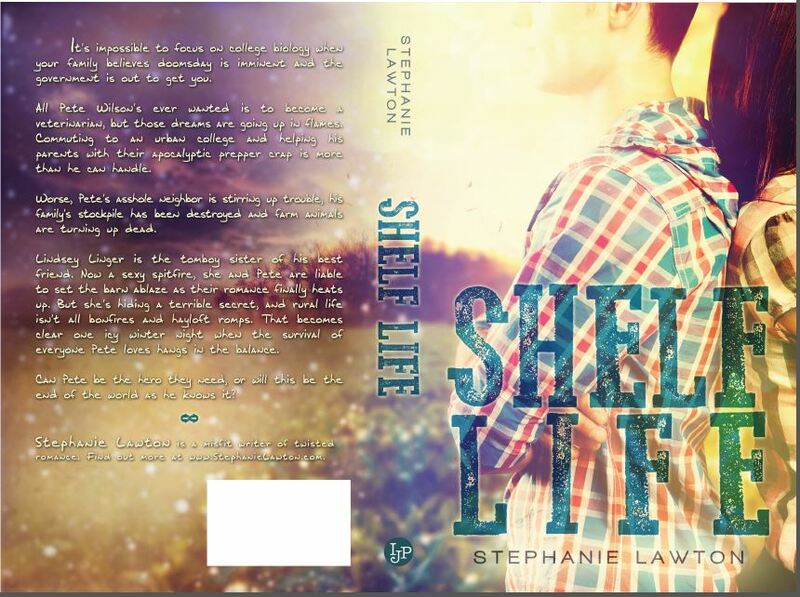 Yesterday, a number of awesome blogs hosted the reveal of SHELF LIFE‘s cover and synopsis as part of the New Adult Sleepover Weekend official blog tour, but today I want to show you the whole jacket. Because it’s perty. And I want to pet it. And because designer Najla Qamber rocks my socks off every single time (she also designed WANT and NEED). I asked her to transition the front into a winter storm on the back (*cough*foreshadowing*cough*) and oh, man, I was transported right back to rural Ohio with those purple snow clouds coming from the west that you just know are going to dump a couple feet of the white stuff–or worse, ice. ANYWAY. Here’s the full jacket cover, minus a few technical elements that will come later! I know, it’s really different from my other covers, but then, so is the story. Rather than being set in the Deep South, this one’s set in fictional Crestlane, Ohio, though it’s loosely modeled after an area in Ohio where my husband and I lived for a couple years. Both of us are from rural Ohio, me up in the northeast corner on Lake Erie, and him near where Ohio, Pennsylvania, and the panhandle of West Virginia meet. In many ways, it’s still “home,” so the setting was easy to write. I’d love to know what you think of the cover. Does it fit the synopsis? Can you get a feel for what the book’s about? Tell me in the comments!